Thanks to streaming and Apple TV, I am no longer terribly behind the times Project Runway-wise. Holy amazing episode from last night, hard and soft with unconventional materials from a florist and a hardware store. Every piece was pretty cool. And guest judges were Bette Midler and Leandra Medine (!!!!!) a.k.a. The Man Repeller. I have been really inspired by her, she has really done amazingly well for herself, and she has become a stylist and semi-celebrity through her honest, funny, creative and personal fashion blog, probably my favourite out there. 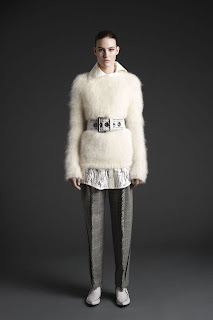 By contrast... McQ Alexander McQueen RTW Fall 2013. Yum.